Keeping up with a workout routine while traveling can easily feel like a chore. Thankfully, Chicago offers so many cool fitness options, there’s no need to clock time on the treadmill while you’re in town. If you really want to break a sweat the old-fashioned way, you can always go on a run or ride along the lakefront path (with complimentary bicycles for Ambassador guests). But if you’re looking for more creative ways to get your body moving, check out these spots within walking distance of the Ambassador. Just don’t forget to treat yourself to an extra slice of deep dish pizza afterwards — you’ll have earned it! Take your workout to new heights by tackling the Climbing Wall at Maggie Daley Park, just east of Millennium Park. 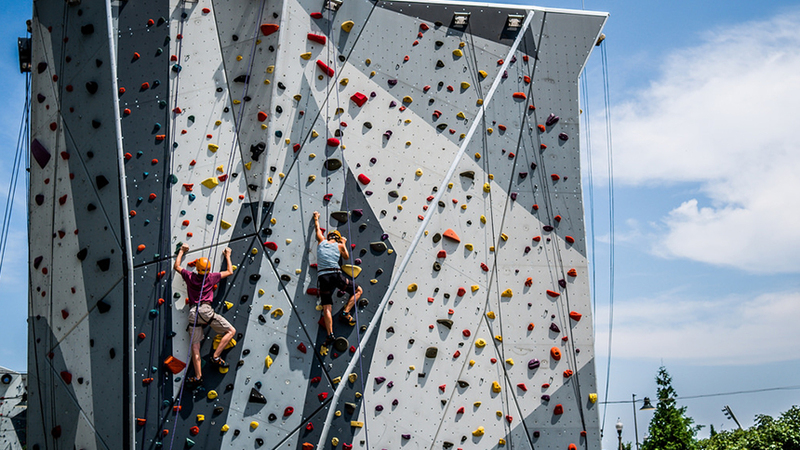 Touted as one of the largest outdoor climbing structures in the world, the wall soars up to 40 feet high in parts and can accommodate up to 100 climbers at a time. Feel free to show up empty-handed – all necessary equipment is available for rent – or bring your own gear with you. You will need to become certified to climb if you’re not experienced (a $29, 45-minute lesson will take care of that). Then just hang out with bouldering, belaying, and top-rope climbing (there’s something for all skill levels here). The only thing more exhilarating than the experience is the view of the skyline and lakefront. You’ve never done yoga like this before. “Flow” like a butterfly while surrounded by 1,000 of them at the Peggy Notebaert Nature Museum’s Judy Istock Butterfly Haven. 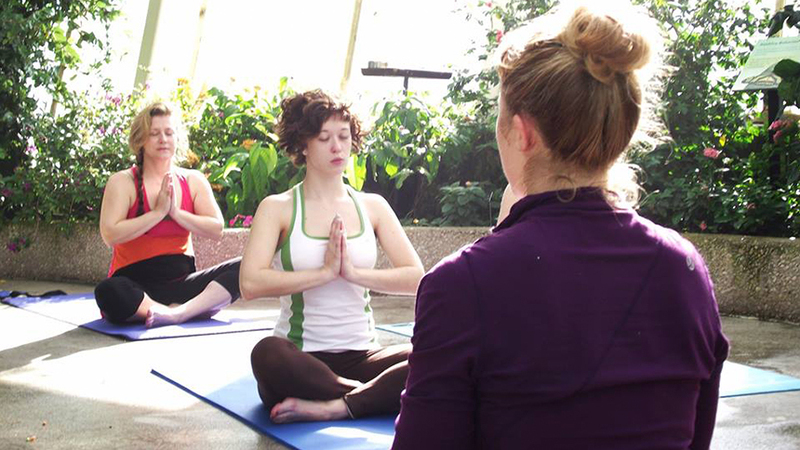 Situated in Lincoln Park, this 2,700-square-foot greenhouse is a perfectly zen spot for a 75-minute yoga class, held every Saturday at 8:30 am through the end of the year. Even when the temperature starts to take a dip, the greenhouse stays tropical, creating a lush oasis of pools, flowers, and trees. You may not practice sun salutations during this nighttime yoga lesson, but you will certainly balance your mind, soul, and — especially — your body. 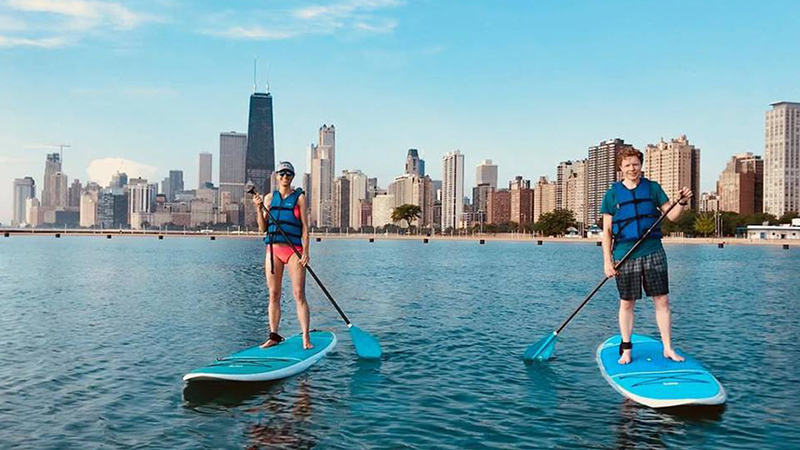 For a spin on traditional stand-up paddleboarding, head out onto Lake Michigan with Chicago SUP for Full Moon Yoga Flow. You’ll brace the board while you’re led through an hour and a half of paddling, gentle yoga, and meditation under the night sky. Of course, Mother Nature plays a big role in this class, so be sure to check their site for the most up-to-date schedule. 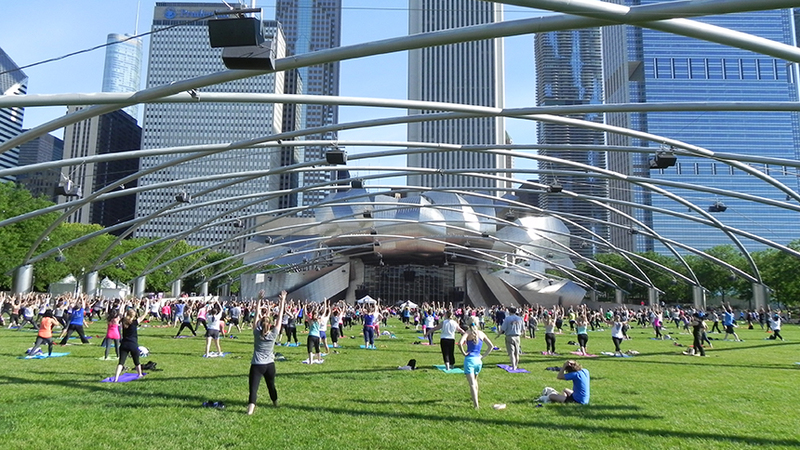 While the Great Lawn at Millennium Park is a popular spot to lay a blanket down and relax during the summer, the scene gets a little spicier on Saturday mornings. Every week at 10 am through September 1, the music is blasting and folks are on their feet breaking a sweat during Zumba. The high-energy (and complimentary!) 45-minute classes are centered around easy-to-follow dance routines set to the tune of Latin and international music. Looking for something more lowkey? 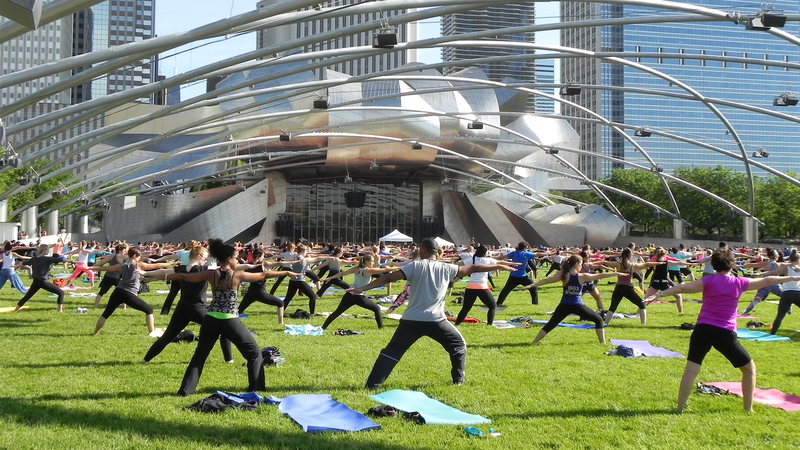 The park also offers yoga or pilates earlier in the day. 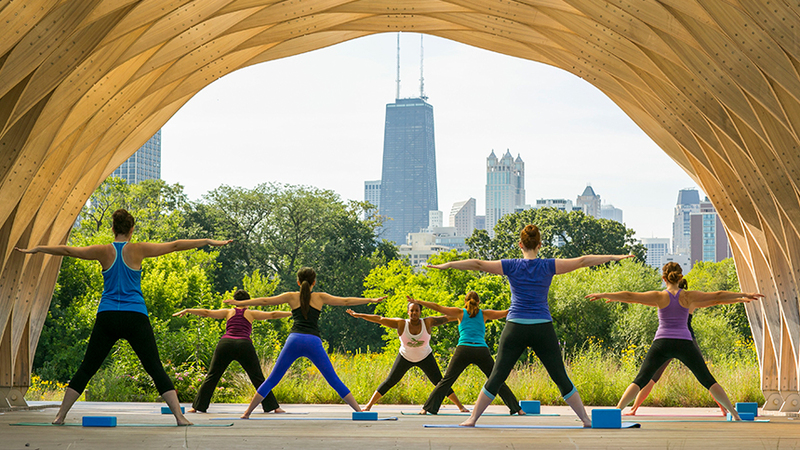 Get a little wild with your workout at the Lincoln Park Zoo, which is home to outdoor fitness classes six days a week through September 30. Reserve a spot online and meet at the iconic Peoples Gas Pavilion on the Nature Boardwalk. The most intense day of the week is Tuesday, which is when you can push your cardio and strength limits with Interval Circuit Training. Need to relax? You can also opt for Meditation Mondays and Wine-d Down Wednesdays, which includes a discount on a post-class – surely well-deserved – glass of vino at the landmark Café Brauer.